With the winter chill dwindling down and temperatures starting to rise, we can finally enjoy the fresh air and outdoor family fun! Springtime often brings some of the best weather for outdoor family activities. After the bitterly cold winter kept us indoors, possibly spending most of our time binge-watching shows and movies, it is finally time for your children to get back outside and enjoy the warmer weather, the grass, and the growing flowers. Spring is a great time to get outside and enjoy some quality time with your family. There are plenty of fun activities and adventures to do, and in this blog, we are going to share some great ways families can enjoy some quality time together. Thinking back to when you were a kid, riding bikes outside with friends and family may be a cherished childhood memory. Bike rides are not only fun, but they are good exercise, especially after a lackadaisical winter. You can have your kids ride their bikes in the driveway or choose to go on a family bike ride together. Choose a quick, fun destination that the kids will enjoy riding to that won’t make them too tired. For example, ride your bikes to the neighborhood ice cream stand for some exercise and a delicious treat. After months of eating meals indoors, it can be nice to switch things up and eat outside when the temperatures start to rise. Dress warm enough for outdoor conditions and have a meal that everyone will enjoy for a unique family dinner experience. Feeling adventurous? Take advantage of the pleasant temperatures before the sweltering heat of the summer arrives and pack a picnic.Include simple, kid-friendly foods, throw a blanket in the car, and head off to the prime picnic location. Even getting a drive-thru meal and taking it to a local park can be fun for all. Going to the park after the winter is almost as exciting as Christmas morning for some kids. If you have a park nearby, plan a nice day to take the kids there to burn some energy and have some fun. With swinging, climbing, and sliding, parks will keep kids entertained until they are too tired to function. You can even plan a picnic around a park day, too. Invite your friends with children of similar age to join you for a fun and exciting play date. Tired of your kids wasting paper, getting marker everywhere, and making a mess? Let them draw and color outside on the driveway with sidewalk chalk! Sidewalk chalk has been a part of many people’s childhoods and is still a popular, fun, and outdoor activity that is enjoyed by children. Kids who love drawing will be able to spend hours outdoors scribbling and coloring. Sidewalk chalk allows kids to be creative while having a blast. Want to make it more fun? Sketch out a hopscotch area for them to jump through. Teach them the rules of the game if they don’t yet know and join in for some family bonding time. Weekends in the spring are the perfect time for a family camping trip. There are few activities that bring families closer together quite like camping does. The time together in the outdoors, discovering new places, and sharing laughter are few of the many things that make camping so great. Camping is a great family activity that involves everyone — the perfect opportunity to begin a family tradition. Be sure to pack the right supplies and don’t forget to bring the smores! If you have a nature preserve, natural or state park, or others nearby that are full of nature, consider going on a family nature walk or hike. Nature is a beautiful thing and spending more time with your children in nature can help them develop a deeper appreciation for it. Be on the lookout for cool critters and animals, flowers, and songful birds. You can even create a scavenger hunt to make things more exciting. If you don’t live near a natural area, a walk around the neighborhood or city can still be a fun time. Spring is when many people start gardening, and involving your children can be a fun experience. Gardening gives children the opportunity to learn how things grow and where some of our food comes from. From getting the soil ready, pulling weeds, choosing seeds, and planting them, kids will likely be excited to help. Get them their own gardening tools so they feel included and more excited about the experience. If the weather is still too chilly for a garden or your home does not have space for one, you can try starting an indoor herb or flower garden with their help. 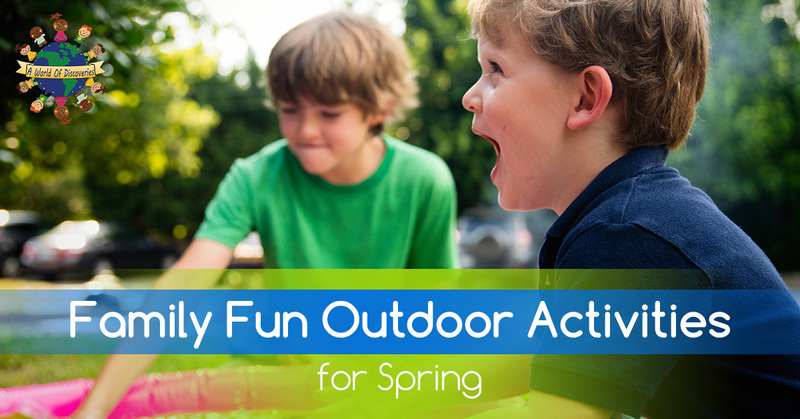 There are plenty of outdoor activities you can do with your children outside and spring is the perfect time to get back outdoors after a long and cold winter. Next time you have some free-time with your children this spring, try one of the above activities for some family fun! At World of Discoveries, we understand that work and the business of life can limit your time outdoors with your children, especially during the week. However, by choosing a child care center that incorporates outdoor play and activities to their agendas, you can assure your child is getting plenty of fresh air and exercise during the week. We always try to spend time outdoors when the weather permits for it. If you need childcare in Columbia, MO you can trust A World Of Discoveries daycare. Your child will be sure to enjoy their time learning, playing, and growing in our childcare. For enrollment information, contact our Columbia daycare today.